Elisha c will take you to the Elisha contents menu. To hear the story read, click the arrow on the left of the bar. Elisha was a prophet. He told people about God. Sometimes he brought them a message from God and told them what God wanted them to do. Elisha lived before the time of Jesus so we read about him in the old testament. We do not really know what he looked like but perhaps he was a bit like the person in the picture on the left. This is a story of how he helped a family. 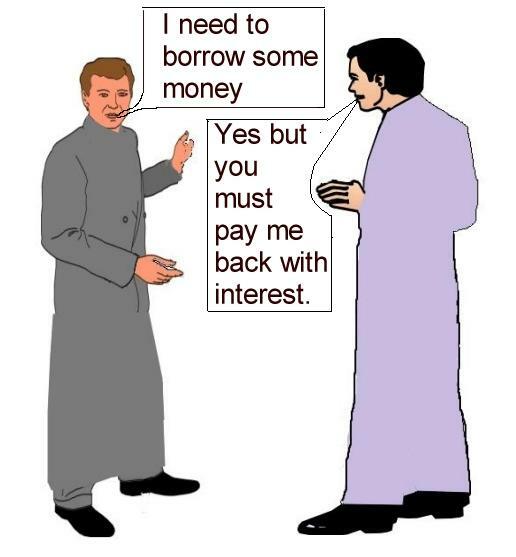 Picture on left: father with money-lender. 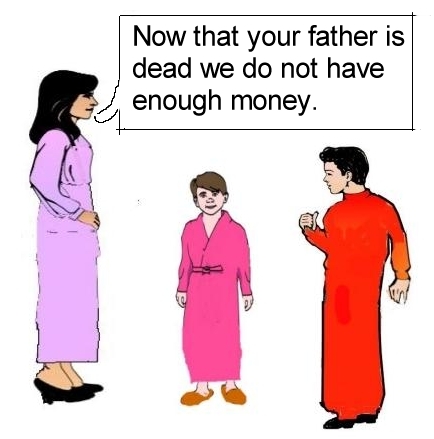 The family decided to borrow some money. We do not know why. Perhaps they needed to buy some seeds to plant their crops for next year. The father was a good worker and he thought he could earn enough to pay the money back. Picture on left: mother with 2 children. But then an awful thing happened. The father died. He would not earn any money now and they were supposed to pay back the money they had borrowed. They talked to the person that they owed money to. 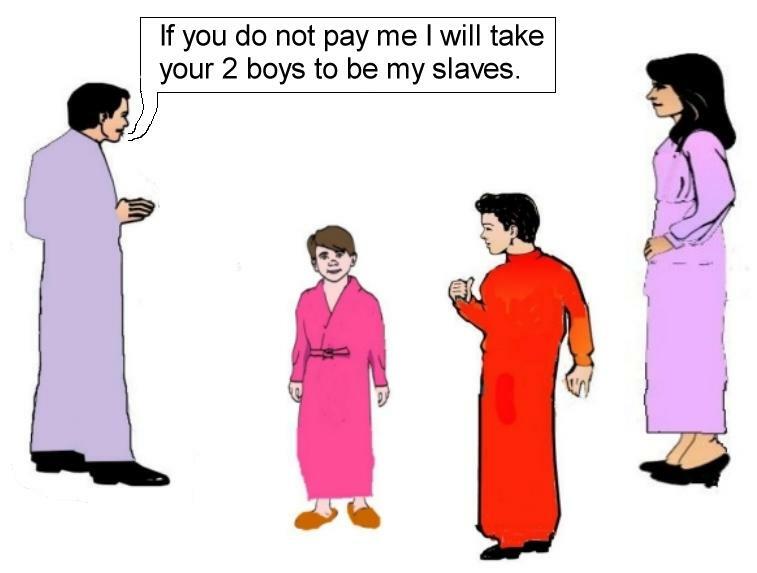 He said that if they did not pay him he would take the 2 sons as his slaves. Picture below: Money-lender with the mother and children. People are not allowed to have slaves in this country today but in the time of Elisha this was quite usual. Slaves had to do exactly as they were told and their master could make them work hard all day and pay them no money at all. The family decided to ask Elisha to help. 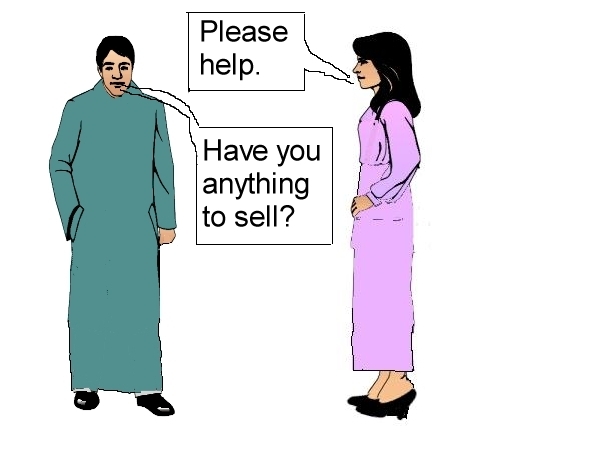 He asked them if they had anything to sell but all they had was a little pot of oil. 2 pictures below: Elisha with mother. 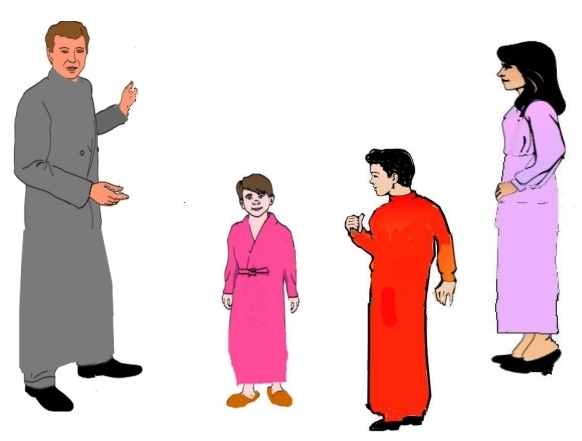 Elisha realised that he would have to ask God to perform a miracle. He asked the woman to go out and borrow some jugs and jars that could hold oil. 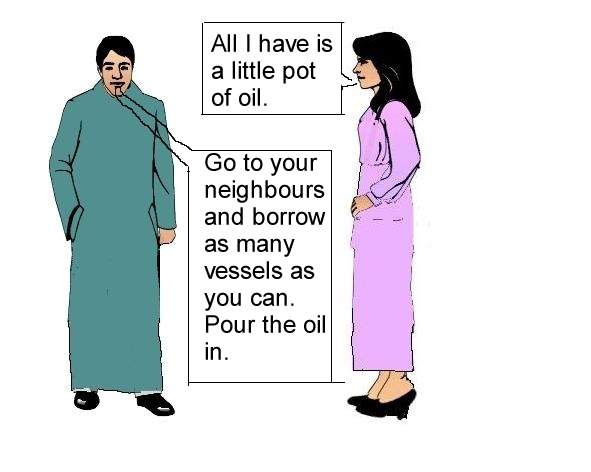 "Borrow as many as you can," he said, "Then pour the oil in." The woman poured the oil into the jars and filled them but her pot of oil did not become empty. God was performing a miracle to provide for her and her two sons. 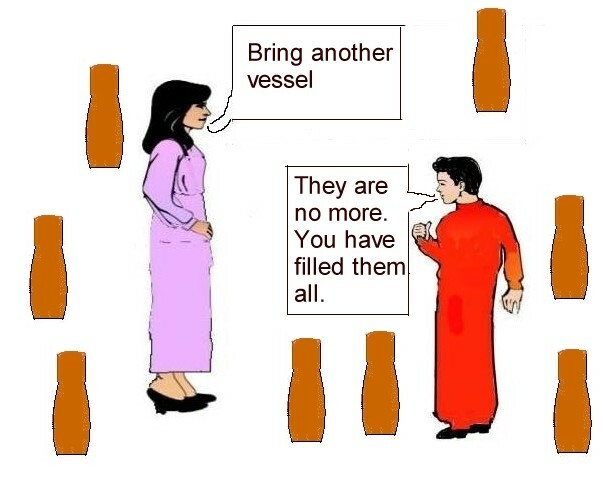 When many vessels were full she said to one of her sons, "Bring me another vessel." "There are no more," he said. "You have filled them all." Picture below: mother and son filling vessels. "Now," said Elisha, "Go and sell the oil and use the money to pay the man ." They did this. God had done a miracle to help them and the 2 sons did not become slaves. 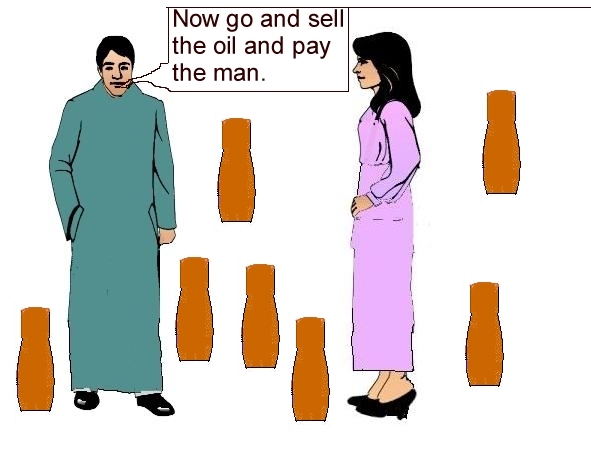 Picture below: Elisha tells mother to sell the oil. Click to go to Elisha Puzzle. The Contents have now been moved to the "Index" page. Click the titles on the brown bar at the top of the page or the black bar at the bottom of the page to navigate to "Index" (with contents) or any topic of interest..